>>Special Thanks to Brennan White for this answer: Brennan is Founder of Pandemic Labs and writes the Pandemic Blog which brings knowledge of social media marketing, experience with social networks and experience with professional media creation together for clients. As is usually the case in my experience, the answer to this question lies somewhere in the middle. That is to say in this instance that both extremes are effective to some degree, but the most effective strategy involves aspects of each theory. In this particular case, the hybrid argument is made stronger by the fact that accomplishing one “extreme” effectively will actually “double dip” and accomplish the other extreme as well thereby erasing the distinction between the extremes almost entirely. To start, it is inarguably worthwhile to have the attention of traditional influencers. One mention from Oprah can “put you on the map” and change your business. A mention will almost definitely create additional blog discussion and a longer “shelf life” of the buzz surrounding your product. In my experience, these are all good things. The difference that a lot of “old-school” marketing and PR folks seem to be missing is that Oprah, the Wall Street Journal and your local paper, are no longer the key influencers that everyone needs to target to build effective buzz for their business. A mention of your new technology offering by Engadget can drive as many views as a mention from the traditional media and those views come from micro-targeted individuals. For example, an Engadget mention will drive people interested in technology to your site, rather than people just interested in overall business in general as would a WSJ mention. It is clear that, while the WSJ provides some targeting of buzz, internet sites generally are more specific and more tightly targeted. Additionally, due to prevalence of blogs, wikis and the like, the number of influencers has become more numerous and your job of contacting them has gotten much easier. Before the rise of social media and the prevalence of blogging, you would have had to compete with thousands of others for precious space in the Wall Street Journal. Now, the intelligent marketers are finding the top 10 most influential blogs in their specific business segment and approaching them directly, thereby drastically decreasing the numbers of unrelated topics that they are competing against. Oprah is no longer the supreme “gate-keeper” that she once was. Not only have the targets changed and become more numerous, but the capital required to target influencers has been eliminated. People used to spend lavishly in an attempt to get the attention of the big influencers (some still do and it would behoove those people to read this next paragraph). Now, due to the new etiquette of blog culture, most new influencers can be approached by email, comment or social network. The price is only that one has to play by the rules. 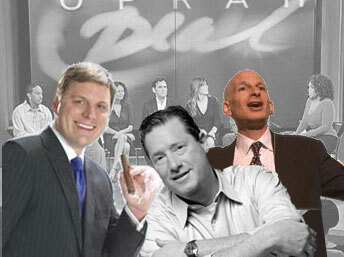 Reaching Seth Godin, Michael Arrington and David Meerman Scott is very possible by email. Even more possible if you utilize social networks like Twitter, Stumbleupon and Digg. When in history has it been so easy to approach influencers? If you put in the effort to build the relationship ahead of time by adding value to their work via comments and information, they’re very likely to spend some time engaging you down the road. Not that long ago, the flow of information was top-down and it paid to be in contact with the few at the top as what they said filtered down to everyone else. Now, the direction of the flow of information has changed. So much so that I’m not sure it can accurately be described as a flow anymore, but rather a myriad of smaller currents of information moving in various directions. Whatever the nomenclature, the currents now move in all directions including, perhaps most surprisingly, up. The great thing about the constantly evolving “democratic” power of the internet is that a new story introduced in a blog post from any no-name blogger has the potential to make the front page of Digg or the headlines of Techcrunch. Even more poignant, the nightly news and political debates are now including bloggers in their broadcasts. The cross pollination of blogs and traditional news outlets has been well-chronicled and serves as proof that the information currents are swirling in new ways. So, when asked which of the two ways I prefer to use when viral marketing personally or how I suggest my clients viral market, I generally have a rather long-winded answer. The take-away is that these days these “two” ways really aren’t distinct anymore. Spreading buzz organically will inform influencers and informing influencers will increase the organic spread (and vice versa). The reason this is true is that, due to the changes in the flow of information, “influencers” and “the general population” are more closely connected than ever. Similar to the idea that the producer/consumer line has blurred to form the “prosumer,” the influencer/Joe-schmo line is also disappearing fast. Since the barriers to accomplish both ways of promotion have been lowered and due to the minimal capital required to do so, every serious viral marketing campaign should incorporate all of these aspects. Yeah, I would agree 100%. I don’t think it so much a question of where or to whom you market, as long as you market yourself effectively enough to reach people. Either audience will, as you said, inspire the other audience to notice you. However, from an advertising viewpoint, I find it often cheaper to target the audience than the influencers. At the same time many of the influential people may never take notice, until the masses begin to talk about you, know matter how much you target them. Either way I would have to go with a 50/50 split, both will do the job. Great post, loved it.